Whether damaged by water, fire, odor, or smoke, the job of restoring one's possesions to their former beauty and/or usefulness takes the skills, patience and knowledge of highly-trained cleaning professionals. 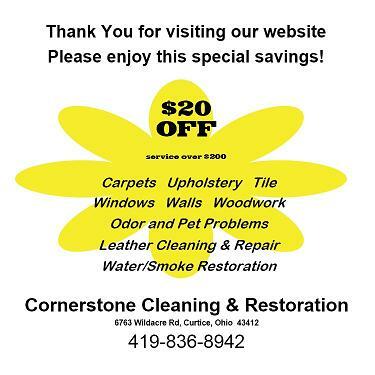 Cornerstone Cleaning & Restoration, LLC is an IICRC Certified Firm. Our restoration specialists have received special training and education. We know how to handle and care for any type of material and surface. We know exactly what can be done and what should not be done to restore badly damaged property to its former condition. Disaster strikes in many forms and a certified specialist can help get you and your home back in order quickly. Rest assured that you have an educated and experienced company handling your problem. Many disasters are covered by your homeowners insurance, and we can help you get the proper coverage from your insurance carrier. We also provide computerized estimates. Above all, our cleaning and restoration professionals are thorough. We leave nothing untouched and nothing to chance.